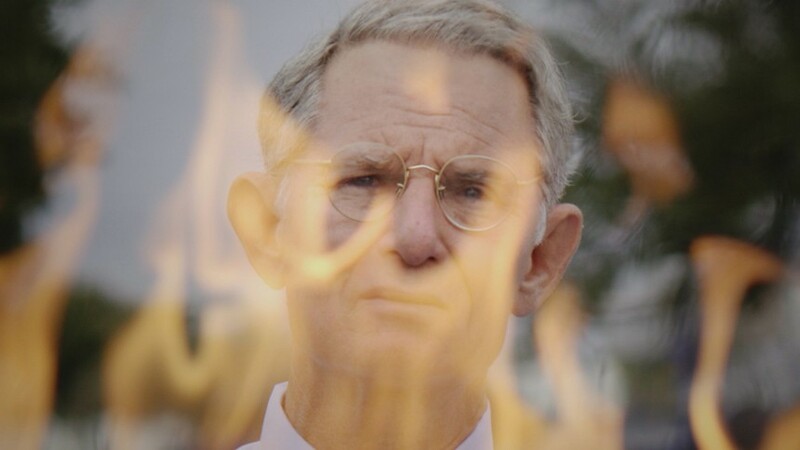 Joel Fendelman's documentary, about minister Charles Moore's self-immolation protest against the racism of his town, tells a compelling, impressively filmed story of the tragic consequences of failing to confront the problems of the past and present. On June 23, 2014, a 79-year-old Methodist minister named Charles Moore drove to a nearly deserted shopping center parking lot in his former hometown of Grand Saline, Texas, poured gasoline on himself, and set himself on fire. The note Moore left on his car's windshield outlined the reasons for his act of self-immolation, which was his extreme form of protest against the long history of racism endemic to both Grand Saline and America in general. The events leading up to, and the repercussions from, Moore's ultimate activist sacrifice are patiently explored in Joel Fendelman's documentary Man on Fire. As opposed to the (literally) burning fervor of its central figure, this film adopts a slow, meditative pace. Scenes of small town life alternate with interviews allowing Grand Saline residents and others to voice their feelings about Moore's act and their town without overt judgment or obvious opinionated inflection on the part of the filmmakers. The interviewees from Grand Saline who speak on camera are, to a man and woman, entirely white, for one simple reason: in this town of just a few thousand people, there are virtually no black residents. To include the perspective of black people in this story, the filmmakers had to go to surrounding towns to find them. These people fill in some of the details of the stories of Grand Saline's fairly horrific treatment of black folks in the past. For example, there are stories of signs warning black people to get out of the town before sundown, expressed in the ugliest language possible; a section of the town called "Poletown," supposedly because lynched black people would be decapitated and have their heads placed on the tops of wooden poles; and the KKK having been active in the town's history. Some of the white residents of Grand Saline, especially the older ones, blithely deny the town's racist history; one even cites the fact that "we had a black president," as if somehow that's an argument that racism is no longer a serious problem. However, there are others, most of them young people, who do acknowledge the racism of their town; for example, one young woman expresses regret for participating in racist chants at sports games, and in staged minstrel-like caricatures of black people. Others speak about how having black friends was actively discouraged. Hovering over all these perspectives is the specter of Charles Moore himself, whose self-sacrificial act forced Grand Saline to reckon with its past and present. It's considerably far from a full portrait, which would hardly be possible in a film of a running time of less than an hour, which is the bafflingly brief running time of Man on Fire. However, there are some teasing details of Moore's life as a committed activist and fighter for racial and social justice, who after essentially being run out of Grand Saline for preaching in favor of racial equality during the civil rights era of the 1950s and 1960s, traveled to Chicago, India, Africa, and the Middle East, among many other locales, combining his ministry with community service. In the 1990s, he led a Methodist church in Austin, where he welcomed LGBT people to join his congregation. However, this portrait of Moore doesn't paint him as a simple saint. Moore's son appears in the film, and he says that Moore's work made him essentially an absentee father; as he was out saving the world, he often neglected his own family. The events that led Moore to self-immolate are also speculated on; some suggest Moore may have been mentally ill, others say he may have been in poor health or even dying at the time he set himself on fire. Still, even in its ill-advisedly truncated form, this is an illuminating, thought-provoking tale that illustrates one of the many tragic consequences of America's failure to fully come to terms with, and to truly confront, the racism of its past, present, and its foreseeable future.